When Whit chose Eric Carle as our feature author this month, I decided I needed to give you a tour of my little two year old Miss Kitten's room. 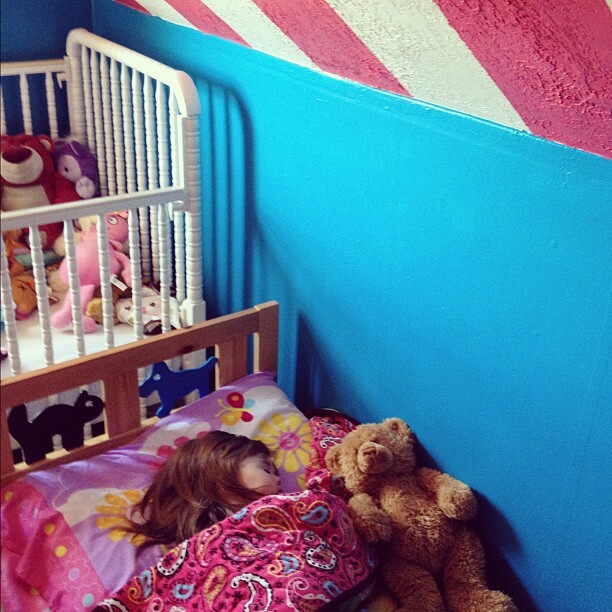 Last summer my kids got room makeovers... 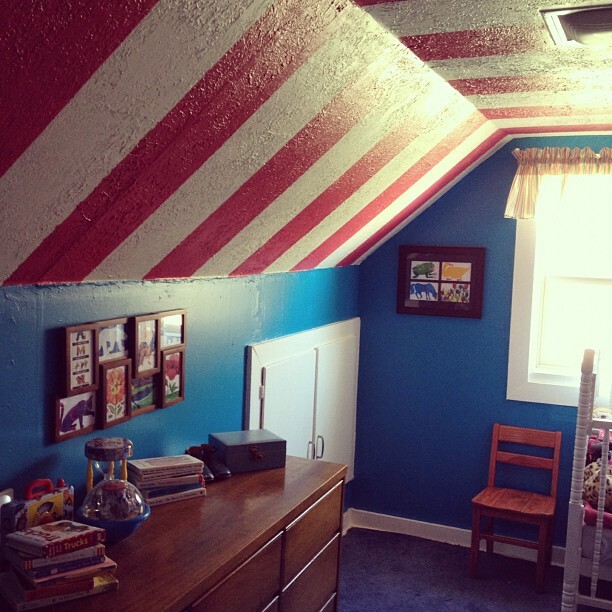 Bright colors- striped ceilings, they got the works! As you can see, I took the pictures you see today during nap time- which apparently baffled Whitney... but seriously with two older (super rowdy) brothers this little chick can sleep through anything. So, here are some close ups of the art. (and me in the reflection taking the picture, how amateur it that? 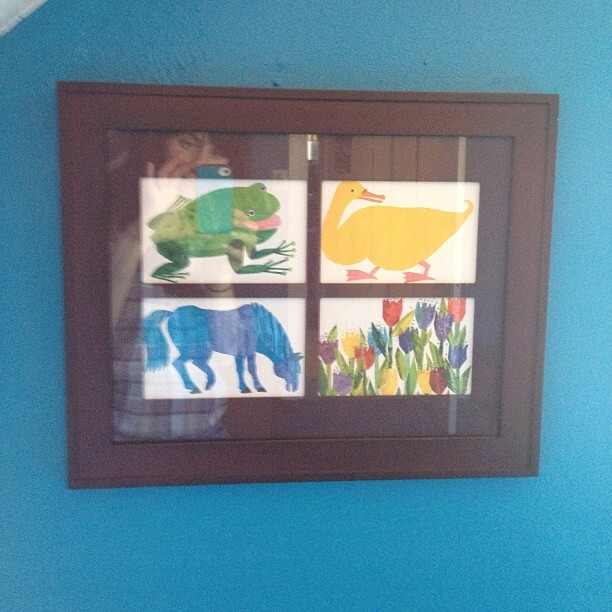 I don't know how to take decent pictures) The story behind this wall art is that several years ago my east coast sister got to go to the Eric Carle Museum of Picture Books (same museum Whitney mentioned here). I was super jealous of my sister and asked her to pick me up a print. With so many beautiful illustration prints to choose from she couldn't narrow it down, so instead sent me a large stack of post cards. 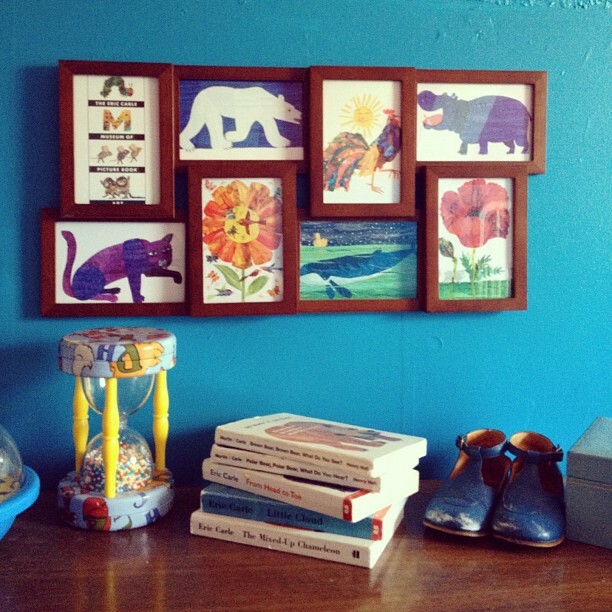 Then when I made-over Kit's room I finally got to framing the cards, and I LOVE the way they turned out! They are the perfect addition to her bright fun room! And not very expensive at all. Considering she gave me the post cards and I just picked up the frames at Michaels or somewhere on a half off frames sale.